This week has been characterized, unusually, by my experiencing a series of mental flashbacks of members of my family who have needed medical intervention for their serious diseases. Not entirely unrelated are the following factoids: • I once had the opportunity to digitize a fragment of papyrus (dating from 3,000 B.C. ), that describes initial Egyptian investigations into brain surgery. • There exist hair-raising stories describing Civil War surgeries in which doctors, recognizing, by then, that speed of operation could minimize shock in a patient, competed against one another in ultra-quick sawing. Superior surgeons completed amputations in record time—albeit sometimes (and more than occasionally, as a matter of written record)—accidentally lopping off adjoining appendages in addition to intended limbs.) • Today, molecular and nanotechnologies promise another revolution in medical practice. Emerging from crude, investigatory beginnings, physicians have progressively mastered knowledge of manifold systems, molecular interactions and interventional techniques. One weekend of my life I will surely never forget took place in the early 1970s. My eldest daughter, Anastasia, was but a toddler. She suffered from petite mal seizures of unknown etiology, for which she took liquid medications. On my way home that Friday I stopped by the pharmacy to pick up a fresh bottle. Typically during a petit mal, we’d observe Anastasia suddenly stop whatever she may have been doing. A glassy-eyed unfocused stare would come over her face for 10 or 15 (?) seconds as her body and limbs took on an uncontrolled rigid jerkiness. Seconds later, all the symptoms would disappear in a flash. Anastasia would appear to be slightly disoriented for a second. Then, she would blithely return to whatever it was she was doing before the epilepsy struck her. But on that weekend’s Saturday morning, her mother and I watched one of Anastasia’s fits with horrible fascination. It had a longer duration than usual and was less controlled. Her body and arms swayed according to what appeared to be a macabre dance choreography. She was obviously more discomfited during and after the long episode. She seemed tired when she came out of it; seemingly, an eternity later. There was. As it turned out we had been, all unknowing, coaxing Anastasia to swallow a medication five times stronger than the dose prescribed for her. Accidents happen. For those who have not met Anastasia, I should explain that the story of this accident ends well. She recovered from the overdose quickly (as toddlers do). Weeks later the genesis of her petit mals was definitively diagnosed as resulting from a disease called tuburous sclerosis. Doctors predicted that Anastasia would live into her teens; but that we could not expect her to survive longer than that. This coming November, our family fully expects to celebrate Anastasia’s 43rd birthday! Although disabled, Anastasia’s is a joyous and cheer-filled life. She works as a weaver in a sheltered workshop (and would gladly sell you some placemats, table runners, or other woven goods she and her colleagues are so proud to create). It surely looks as if she may outlive me! Predictions, even medical predictions, don’t always come true. In my Cancer Clinic, I wear a wrist bracelet with my identification. Even so, as each new bag of medications is attached to the IV pole, the nurse asks me to state, aloud, my name and birthdate. When particular drugs are being prepared for infusion a second nurse is summoned to witness my answers as to my identity, and to corroborate that the medication being injected into me is the one that has been prescribed for me and not another patient. This procedure should console me… save for the fact that I know that such a regimen would not have been put into place had there not been prior experience of mistakes being made. When I appeared at my Cancer Clinic last Friday it was to be “unhooked” from my fanny pack with its 48-hour continual infusion. I was greeted cheerfully by the attending nurse who said “You’ve been here before [and presumably know your way around]. Go on in, and get comfortable. Someone will be with you in just a moment.” Confidently, I strode down the hallway but quickly found myself in a warren of physician’s offices and small specialized laboratory rooms. I’d clearly gotten lost and didn’t belong there. Abashed, I retraced my steps and eventually found my way to the infusion rooms. I’ve got a pretty good sense of direction. I didn’t even get very lost in the wonderfully crooked streets of Rome or Milan, or the anti-parallel ones of Krakow. [In the case of many Medieval Cities, the central nest of alleys and narrow lanes are not merely artifacts of geography or topography, but were intentionally designed to confound and confuse intruding marauders who might have penetrated the outer perimeter walls of the city.] So I was curious about having gotten lost in an office building… until I realized that, quite possibly (read “likely”), I didn’t really WANT to get to the infusion rooms. 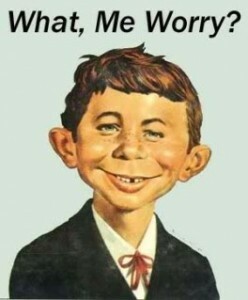 The mischievous face of Alfred E. Neuman mocks me with his iconic motto: “What, me worry?” Sure, me worry. And for good reason. Nevertheless, I feel embarrassed to admit to Fear particularly when I know, full well, the proper actions to take, and know that I WILL take them. [Isn’t Fear unnecessary under such conditions?] In addition, I am intensely conscious of what an extraordinary gift it is to have access to and to receive the care I’m undergoing. [Doesn’t Fear denigrate such an undeserved gift?] I am intellectually confident and, indeed, certain (as can be) that the treatment I’m receiving will rid me of my cancer. 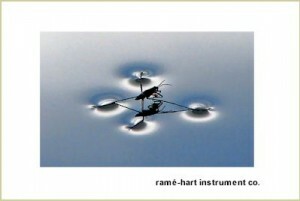 [So why be Fearful at all?] Yet, Fear exists. My relation to Fear seems to be another conundrum and paradox. I’m becoming increasingly aware of living with such conundra. But despite the awkwardness I feel about feeling Fear, I am very grateful that this core instinct is not diminished in me. I am frightened. I’ll go. But I’m right to be wary.